The US military says its controversial Thaad missile defence system is now operational in South Korea. The system can intercept North Korean missiles although full operational capability is still some months away. Tensions have been rising around the Korean peninsula, with repeated threats from North Korea and the presence of a group of US warships and a submarine. North Korea reacted angrily to the latest military exercise, accusing the US of risking a nuclear war. The rise in tension comes only a day after US President Donald Trump said he would be "honoured" to meet North Korean leader Kim Jong-un, in the right circumstances. The US announced last week it would activate Thaad, which was not expected to be in use until late 2017, within days. Thaad, which stands for Terminal High Altitude Area Defence, has been installed at a former golf course in the central county of Seongju, amid angry protests. Many locals believe the system is a potential target for attacks and endangers the lives of those living nearby. China also strongly opposes the system, believing it interferes with the security of its own military operations. On Tuesday, it demanded the deployment be halted. Beijing would "firmly take necessary measures to uphold our interests", foreign ministry spokesman Geng Shuang said. However, Mr Geng welcomed Mr Trump's suggestion of meeting Kim Jong-un, saying China had "always believed that dialogue and consultation... is the only realistic and viable way to achieve denuclearisation". When the announcement of the Thaad deployment was made last year, North Korea promised a "physical response", with state media expressing the "unwavering will of our army to deal a ruthless retaliatory strike". North Korea crisis: Why now? Are N Korea's neighbours worried? 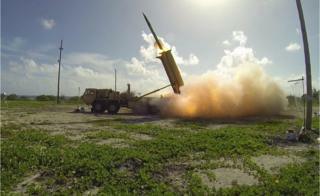 A spokesman for the US forces based in South Korea said Thaad now had "the ability to defend the Republic of Korea". But the system only has "initial intercept capability", a US defence official told AFP. It will be strengthened later this year as more parts of the system arrive. North Korea and the US have traded heated rhetoric in recent weeks as Pyongyang continues to defy a UN ban on missile tests. North Korea has carried out two failed missile launches in recent weeks and has said it is ready to carry out its sixth nuclear test at any time. The North reacted angrily on Tuesday to a joint US-South Korea military exercise the day before involving two supersonic B-1B Lancer bombers, which it said was a "nuclear bomb dropping drill". "The reckless military provocation is pushing the situation on the Korean peninsula closer to the brink of nuclear war," the North's official KCNA news agency said. What is the Terminal High Altitude Area Defense System (Thaad)? The launcher trucks can hold up to eight interceptor missiles. Are North Korea's neighbours worried about an attack?